July | 2013 | We Can't Hear the Mime! That, however, was in Victorian times. Since then there has been an influx of creative people who do nothing but criticise the British Education system (Thank you Pink Floyd). Yet often these self-same critics saw it through to the end. They chose to stay in the establishment they hated, an establishment they did not believe was suited to educate young people. An Education tells the story of another of these potential rebels. A cautionary tale to those threatening to go against the flow of a country. Carey Mulligan plays Jenny, a bright young girl who is destined for Oxford University. Her parents are far more keen for her to do this than Jenny herself. She dreams of a path less travelled. Her dissatisfaction with this position is painfully evident from her small rebellions, her awkward French interjections in a cut-glass accent and the thrill of being allowed to listen to her own music. Poignantly, Jenny finds herself studying Jane Eyre while in a whirlwind affair with an older man. A cautionary tale within a cautionary tale. Both tales telling young girls not to throw away their lives on such uncertain things as love. Yet in both cases, they would have been success stories were it not for the faults of the men. These stories are a way of keeping them in the system for as long as possible. There are generations of stories and teachers saying the same things. Stay in school, get good grades, this is your passport to life. What An Education shows us is that it is only through living a little ourselves that we can appreciate how important learning truly is. However this is the eternal paradox which Jenny discovers the hard way. The very life experiences that show her the necessity of education are denied to her by the education system. Once more we see a conflict in generations. A post-war teenager, desperate to be free and happy, comes face to face with the old values of her parents and teachers. Unfortunately she is too old to blindly listen to them and has too little experience to see the reason in their beliefs, which she does eventually concede. As they say, one can only learn from one’s own mistakes. As much as you can criticise a system it is unwise to reject the only accepted currency. At the very height of her freedom Jenny has to concede defeat and crawl back to the very establishment that has shunned her in order to continue her life. She is turned away at all counts, due to fear and judgement, two things she has lived free of for months while having her affair. Yet even when everyone genuinely did have Jenny’s best interests at heart she was lead astray by short term indulgence and happiness at the expense of her future. To regain what she has “lost” as a result of this happiness requires consulting the people who she laughed at. Eventually the only person left to her is a bespectacled and lifeless teacher. The older version of the spotty specky Oxford girls she didn’t want to become. One more child caught in the trick of youth, she becomes an adult and finds that she has spent every day of her life sacrificing present happiness for an unknown future. While Jenny’s teachers assure her that four years at University is nothing, she cannot help but feel that the future she dreams of can only recede further as each year presents more time that must be sacrificed. Jenny gets to Oxford, but at what price? From dating a man who showed her everything she wanted, she now must date “boys” and pretend her brush with real life never happened. Such acquiescence is reminiscent of Orwell’s 1984 dystopia. It’s not a system that the protagonist agrees with, but it is the system he must live with and so he enters willingly, but is he happy? Youth is not wasted on the young, it is stolen from them by the rat race they are placed in as soon as they reach schooling age. This entry was posted in Film Reviews, Personal Screen and tagged An Education, Carey Mulligan, Dominic Cooper, Film Review, Lone Scherfig, Rosamund Pike on July 31, 2013 by Flo. The transition from child to adult is a topic that has fascinated storytellers for generations. From the time of the very first bildungsroman up to the present day, some belief has persisted that a story of becoming mature, framed in the correct way, could shape adolescents into better adults. Stoker does not do this. Stoker allows the process of losing childhood innocence and entering a world larger than your own to flourish in it’s full fear and gore. Mia Wasikowska plays India, a girl who loses her father on her 18th birthday. From this point onwards she must deal with grief, fear and sexual experimentation on her own. She has literally outgrown the vestiges of her childhood but is not yet ready to become a woman. What is bizarre about this transition is that it seems to happen in the course of a few days, at most a few weeks. Placed into close contact with her uncle, an embodiment of temptation and darkness, she starts to discover herself. The use of blood in this film speaks volumes. Each stage of India’s sexual journey is accompanied by a release of blood. She matures as a woman at each stage, shedding her demure, uptight clothes for progressively more attractive and freer-styled attire. Her journey is twisted incestuous, sensual and violent. An appropriate styling for the female experience. In a world where women are consistently taught that sexuality is a sin, it is not over-dramatic to render this journey in terms of murder and terror. The film’s depiction of family presents a division between India’s maternal and paternal bloodlines. India connects emotionally only with those on her father’s side of the family, leaving her mother (Nicole Kidman) confused and shocked by her own daughter. Eventually she even grows to fear this girl who has clearly chosen the opposite side of the family. Every member of the father’s bloodline, however, displays enduring love despite incredible, torturous circumstances. India is once again caught in the middle of these forces as she tries to become her own woman, taking what she was taught as a child and applying it to her own reality. In the end she is faced with a choice, but even then it is difficult to know whether she chooses to avenge her father or save her mother. This seems to be the only way she can accept both influences; to interweave them to the point where they seem to be the same goal. The film is unique in its editing and cinematography, more resembling a comic book than any form of moving media. Time is distorted as memories, recollections and storytelling merge into one. Each important moment in fact seems to be happening at the same time. In one scene this even goes so far as to place past present and future into one short sequence of taking a shower. Oblique camera angles and negative space dominate and lend the film a surrealism which counteracts the shocking immediacy of the action. It seems to be set somewhere far off from reality yet in a place that is universally accessible to the viewer. This is what many artists have striven for over the years, to translate the specific plot to a universal experience. This is what Stoker excels at. This entry was posted in Film Reviews and tagged Chan-wook Park, Matthew Goode, Mia Wasikowska, Nicole Kidman, Stoker on July 29, 2013 by Flo. It is rare that I find myself utterly in agreement with every accolade a film is given. I watched this film two years ago and failed to understand it’s significance. 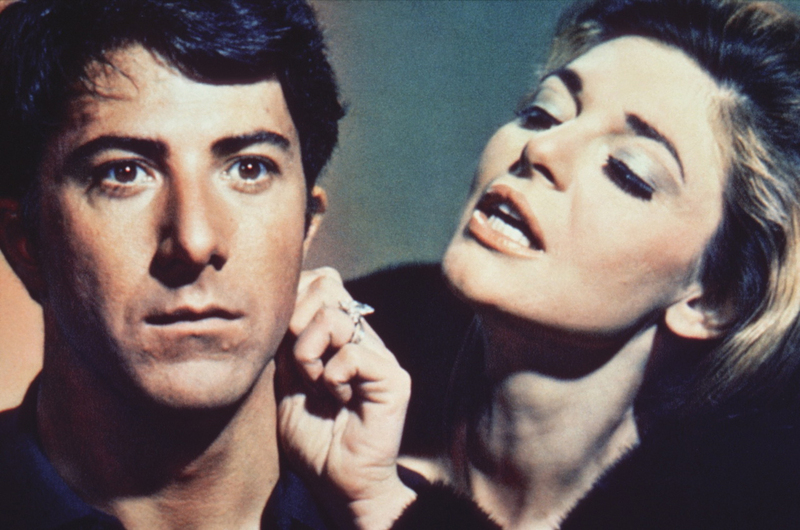 The Graduate represents such a drastic shift in cinematic grammar, that to my less experienced self it seemed to be awkward, lingering and almost foreign in its delivery of a story. Two years later, and I can see this as the bold masterpiece it has always been described. The opening scenes place Dustin Hoffman as a young man in the world of adults. He is unnatural in his surroundings, the camera thrown in his face and never leaving. We scrutinise him as an audience, just as much as those he is running away from. Hoffman’s short stature is exploited, making him seem younger than the man he is, literally dwarfed by the adult world. The lingering shots never allow him time to falter or pause, he is forever observed and judged. This established pattern is, of course broken up, by the infamous Mrs Robinson. Her presence brings with it jump cuts, split second editing and even less time to think. However the film does not present a merciless onslaught to the viewer. There are moments to pause as there are in life, and the film furnishes these in music. The whole soundtrack, including diegetic music is performed by Simon and Garfunkel, which lends it a cohesive quality rarely found in films where music is used so prominently. It is almost a musical in a way, the songs take centre stage, as all other sound is muted and you simply appreciate the lyrics in conjunction with the unfolding story. The story seems to straddle the gap between two generations. The parental characters are perpetually nameless and known only in terms of their marital status, despite the inherent problems in these marriages. The young man Benjamin is no longer a child and must enter this adult world. He is forced into certain modes of life, his parents force him into a swimming pool in a diving suit, yet criticise him for enjoying the water on his own terms. The attitudes of the adults he meets throw him into their dysfunctional world of alcoholism, disillusionment and broken marriages. Despite all the circumstances against it, we are suddenly, halfway through the film, presented with a couple who have fallen in love. It is not their own wills which hinder them from living this out, but the manipulations and machinations of their parents. While both parties are desperate to live their own lives, and make a great show of their independence, it takes them until the very last minute to gather the strength to fight against this established regime. The film also functions as an exploration of late adolescence. A period of time when everyone has an opinion on how “the best days of your life” should be spent. Benjamin is plagued with worry about “his future” a nebulous term that reveals itself less the more you worry. It is difficult to know whether Benjamin (Hoffman) is freed or trapped by his experiences in this time. He is always portrayed crossing the screen from right to left, the wrong direction. Yet can it really be wrong? Modern convention teaches us that he is doing what is right. He is defending himself and fighting for what he loves. Where is the line which makes a person indefensible? Does the power of “true love” really excuse his errors? The final five minutes of the film attack these questions in full force. Even once they have broken fee of their parents, and the expectations that have been thrust upon them, as they escape the failed marriages and unrequited love that they watched their parents experience, they seem to be, above all, confused. They smile at their reunion but soon settle into the fear that they genuinely do not know what will happen next. There is no one to force, guide or coerce them for the first time in their lives. The soundtrack switches into the very same song it played at the start, but it is a different recording. Is this change enough to stop them from slipping into leading the lives they ran away from? We can but hope. This entry was posted in Film Reviews, Gold Screen and tagged Anne Bancroft, Classic Film, Dustin Hoffman, Film Review, Katharine Ross, Mike Nichols on July 29, 2013 by Flo. This film starts very simply with an idea, what would happen if you got to be a part of your own escapist fantasy? From there the film becomes a crash course in some of the key philosophical and social issues of our time. The first section could easily be the beginning of a lighthearted teen comedy. Two teenagers (Tobey Maguire and Reese Witherspoon), caught in a slightly supernatural series of events, end up in a TV show and have to blunder through their typical sibling rivalry to find their way back to normality. However the first of many inversions is about to take place as we realise that this ‘picture perfect’ life is only as deep as the screen. An insightful comment on the power of television to mesmerise and placate the consumer. Maguire’s character believes so wholeheartedly in the perfection on the screen that he neglects his real life and broken family situation. As time goes by with the siblings stuck in Pleasantville, this black and white soap opera starts to change before their eyes. Bit by bit, colour appears in the lives of the people of Pleasantville. A remarkable technical feat as the film fluently introduces colour and takes it away, all the while still allowing the black and white world to interact with the colourful one. Between the two of them, David (Maguire) and Jennifer (Witherspoon), literally bring colour to people’s lives as they break through social norms and self-imposed rules. Pleasantville stops being a neutral place, the predictable saccharine scripts fall through. With the good, however, comes the bad. If we are to see every ‘colored’ person (a daring piece of scripting on the part of Gary Ross) as having removed and rebelled against what has held them back we must see the non-coloured people as repressed to the point of fearing freedom. They have created a totalitarian state for themselves, founded on unspoken laws. This is portrayed cinematographically and allegorically. Those in black and white automatically appear to a modern viewer as if they are older, a group of people lost in the visual past. We see an Edenic coloured scene with a bright red apple. It is a coloured woman offering it to a non-coloured man. We see books being burnt and shopfronts destroyed. The town leaders are filmed from below, their power over the citizens in undefinable but undeniable. Segregation laws are put in place and exercised, an impromptu government bans art and music. These embedded ideas of right and wrong resonate with the viewer, yes they are obvious but it is the combination of all of them which lends them such power. How quickly a perceived utopia can become the dystopia we fear and avoid. However this is also a story of personal acceptance. Each of the main characters experiences a very different personal journey. Emphasis is placed upon each person’s experience of life as some overcome sexual repression, others emotional repression and some intellectual repression. However each character learns that despite what they have been told and led to believe they each have far more beauty and potential inside themselves than they had previously allowed. In the end all the artifice has been stripped away. The world is no longer perfect but there is at last true beauty, variety and emotional expression. This entry was posted in Film Reviews and tagged 1998, cinematography, colour, Film Review, Gary Ross, J.T. Walsh, Joan Allen, Pleasantville, Reese Witherspoon, Tobey Maguire on July 26, 2013 by Flo. It always interests me when a director approaches filmmaking in a unique way. For this film Doremus not only had no script when shooting started, but also insisted that his two lead actors remain in character during the whole shooting process. While I, to this day, think that this is a fascinating and potentially groundbreaking way to work, I feel that Like Crazy could have achieved more than it did with a more traditional approach. The scenario of the film is certainly thought provoking. The film begins at what would normally be the conclusion; two young people have fallen in love. However for this couple it is not to start with ‘happily ever after’. When Anna’s (Felicity Jones) visa runs out they are forced to embark on a long distance relationship. What is interesting about this portrayal is how it treats Jacob and Anna as opposed to their other relationships. The time that the two protagonists spend together melts happily into montage and piano music. It is ethereal, and untouchable. The cinematic language of love: soft focus, spinning on a beach, fairgrounds at night places the viewer with Jacob and Anna as we see this relationship as “the one”. Additionally, on closer examination the secondary relationships which they form away from each other are perhaps healthier, definitely more stable and with decent, kind and devoted partners. Yet Jacob and Anna, like the audience, believe in their true love. When they interact with their secondary partners the cinematography is flat and bland. It is almost imperceptible, this shift, yet it makes the relationships less glamorous, less beautiful. Doremus is exploiting the narrative properties of the screen to put us into the same state of mind as the protagonists. No matter how suitable their new partners are they are both drawn to the indescribable magic of their true love. It is only when we see Jacob and Anna interact without mysticism that their relationship is truly striking. In the third act of the film they fight, it is a simply filmed scene. The camera is stationary and the shallow depth of field that has existed around them fades away. They are suddenly displaced from their fairytale romance and stuck in the harsh reality of living life. However, even as they fight, they are caring, they are both hurt by the same things and in the end it is concern for their relationship which has driven them to be angry in the first place. Here is where the film needed a stronger script. While both Felicity Jones and Anton Yelchin are admirable at portraying the happiness of falling in love with someone, they both struggle as the emotions become more complex. After a while it feels as if both actors are simply reciting clichés and platitudes in an effort to incite emotion, when the situation and the craft of Doremus called for much more subtlety. There are scenes where mere silence could have better expressed the pain felt, yet both seem to insist on filling these silences with more, essentially meaningless, words even when the message has long ago been understood by both parties. Much as the film is about the struggles of falling in love it does still end on an uplifting note. After all the problems and years Jacob and Anna can be in the same place at the same time. We are never shown what becomes of them eventually but at least they get their shot at a future together and with a love that has been so clearly strong throughout it seems unlikely that they will ever part. This entry was posted in Film Reviews and tagged Anton Yelchin, Drake Doremus, felicity Jones, Film Review, Like Crazy on July 6, 2013 by Flo.